We may only be in to episode 2 of The Grand Tour, and already we are at the stage where we are being treated to a special. 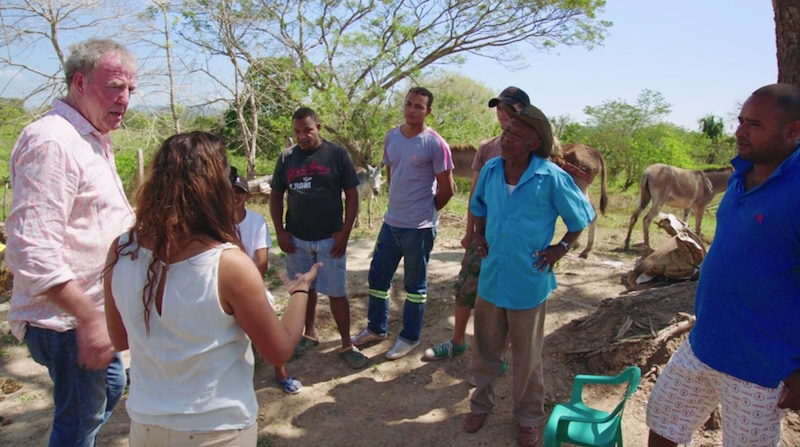 Season 1 saw the trio take to Namibia in beach buggies, season 2 took place in Mozambique, so what’s in store this time around? Clarkson, Hammond and May are set the task by Amazon (supposedly) to get some new wildlife photos that the American entertainment and mail order giant can use as its screensavers on its Prime Video service. The location for this ambitious quest is the place of a certain white powder. No, no, not sugar. It’s the homeland of Charlie, which of course is, Colombia. Hammond chooses the meeting point, which is a tropical beach in Cartagena, at a time where most people ought to be in bed, 4am. 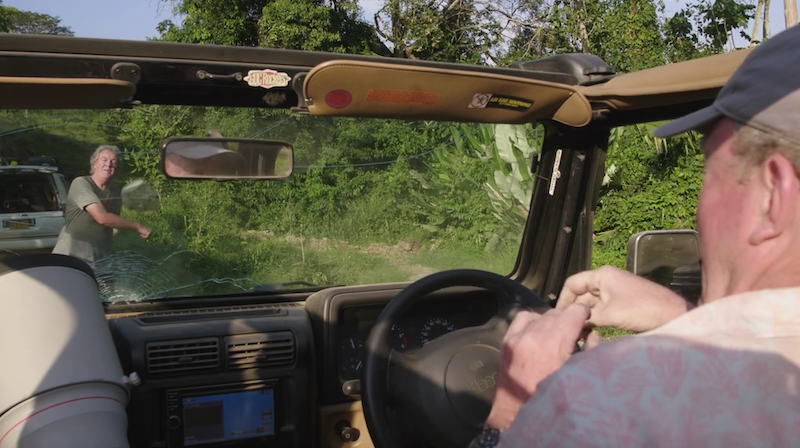 As is normally the tradition, James May was the first to arrive, in a car that looked like it would simply crumble the moment it was asked to go up any kind of dusty incline, an old Fiat Panda 4×4. Kind of an obvious choice I suppose, bearing in mind Captain Slow has a modern version of the Panda. Or did have, I don’t know whether he still owns it. Clarkson was the next to arrive, in something a bit more rugged and as May suggested, a bit camp. 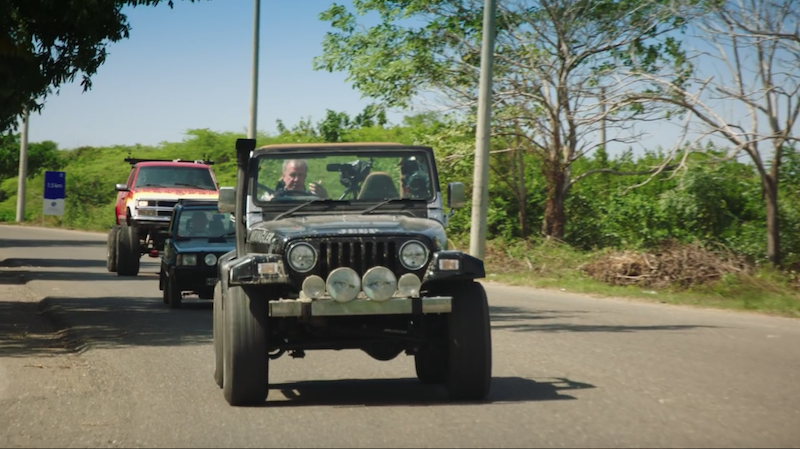 That is of course the classic outdoor runabout, the Jeep Wrangler. 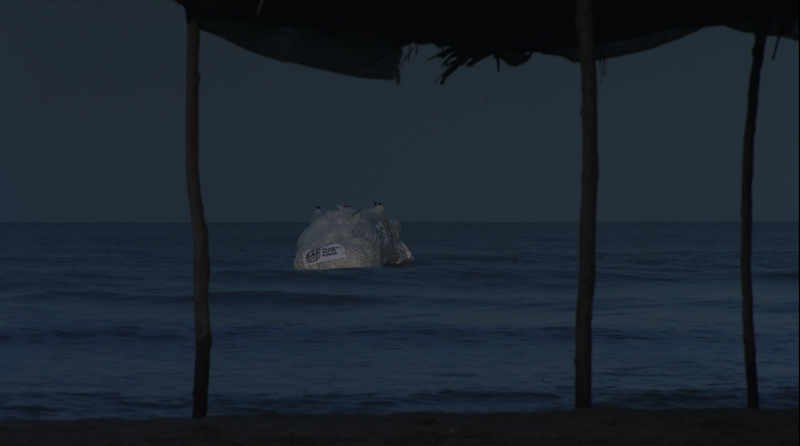 May made a few gay gags but he, and Clarkson, were rather distracted by the large floating thing approaching the shore. This turned out to Hammond with his unashamedly American Chevy Silverado, which had been ‘delivered’ in way that made use of Columbia’s ‘interesting’ import/export trade. You get the hint. One daylight arrives, the trio set out to get Hammond’s ‘subtle’ pick up truck on to shore, which predictably goes wrong. May ends up with a wet car and broken cameras, whilst Jezza almost takes out some of the beach’s property. In the end they use a winch to drag out Hamster’s mammoth vehicle, whilst taking out more property in a rather predictable and worn out gag. Sorry chaps, just being honest on that one. Mind you, I did rather enjoy Hammond’s method for getting out of his very high riding Silverado. With the three of them finally on the beach, it was time for them to head in to town – that was eventful for Hammond – and start the task of getting some animal pictures. As well as three very different cars which all had the purpose of being rugged and dependable (sort of), the trio took different approaches when it came to the camera gear used for the job. Hammond seemed to have the best gear, but it soon became clear that it’s only effective if the person using it has some idea of how to actually use it. Clarkson and May didn’t do much better though, snapping pictures of only local dogs and a few pigeons. This is clearly not enough, following a text from Mr Wilman, whom instructs them to go out in to the countryside and get pictures of proper animals, including a jaguar, a condor, and even a hippo. After venturing out in the sticks a little bit more, we’re treated to what I believe is one of the weirdest and surreal scenes on The Grand Tour. Clarkson attempts to photograph a donkey when it looks as if the man behind it is erm, well, “having relations” with it, as Clarkson put it. He then decides to go in to village with an interrupter in tow, to find out what is going on. 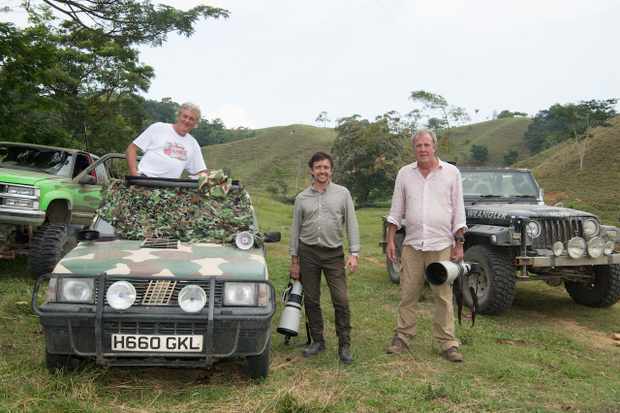 Anyway, that aside, the trio break out the map, quickly deciding that they need to head south towards Santander (not the bank) in an attempt to find jaguars. This meant crossing bridges that weren’t suitable for overweight pedestrians, let alone cars, which turned out to be a of a problem for Hammond’s super-sized Silverado. Hammond wasn’t the only one on for a hard time though, Clarkson was being battered by the hard ride in his Wrangler, and Mr Slowly then had a breakdown in his Fiat. What, a Fiat, breaking down? Unheard of. After Clarkson tries to get past his colleague’s car but only hitting it instead, May sees red and lobs a rock at Clarkson, breaking his Wrangler’s windscreen in the process. This could well have been staged, but given the spiky atmosphere at the time, I reckon that was real, and it certainly felt it as a viewer, because all of a sudden the watch got rather tense. This was not helped by the fact a few moments later Hammond reversed in Clarkson, claiming that he hadn’t seen him. Don’t worry, they kiss and make up later on. 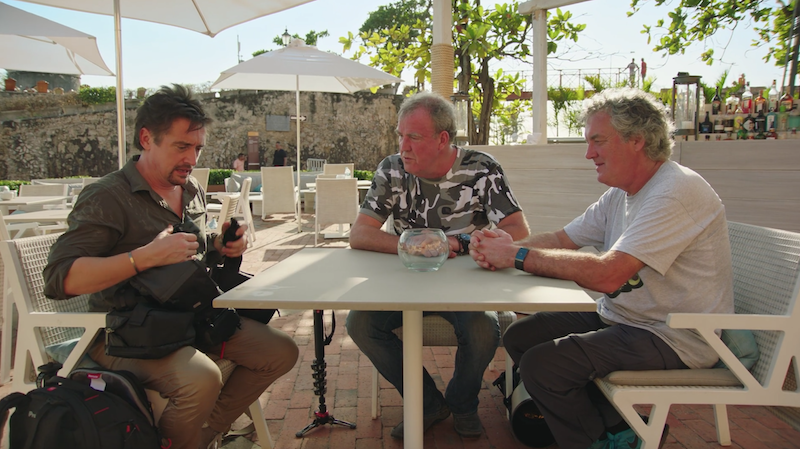 From that point on, not a lot happens; May loses his exhaust, Hammond realises he has no working headlights, the trio set up trip cameras in a bid to catch a picture of a jaguar, and Clarkson and Hammond mess with May be moving his Panda, and…that’s about it. There were some good points in this episode (the ice cream gag was quite clever) but overall, part struggled to keep me fully engaged at points. It’s difficult to put my finger on it, I wouldn’t call part one boring, it just felt a little slow in points and it didn’t feel like anything particular new was being brought to the table. Some of the gags didn’t hit the mark in my opinion and certain bits just felt a bit too staged for me. Maybe part one then, is a slow burner and the real fireworks are to come in part 2. I just wanted you to know that, as a Colombian, I found the “donkey bussiness” in the episode probably the funniest part. Is an ongoing joke/political comment/kindaracist remmark(?) that people in the atlantic coast really get into that sort of action, so it let me wondering if it was even staged (btw, local response was quite honest).